GoPro has released an unbelievable video of French daredevil Guerlain Chicherit's terrifying car crash while attempting the world's longest car jump. GoPro has done it again and managed to capture another breathtaking moment on its resilient camera. The GoPro original production team has released footage of Guerlain Chicherit's death-defying car crash while he attempted to break the record for the world's longest car jump back in March 2014. 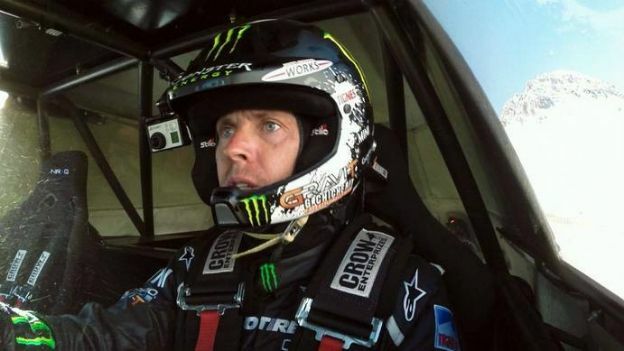 The French rally driver and professional skier was aiming to break Tanner Foust's record jump of 332 feet set in 2011. Initially all seemed fine when he completed a few trial runs successfully, although on his first attempt on the big jump Chicherit lost control of the custom Mini and ended up in an uncontrollable roll. The entire crash was captured on multiple GoPro HD Hero3+ cameras resulting in jaw-dropping footage of the moment from all angles. The whole thing has been slowed down enough to see the terrible crash step-by-step. James Kirkman, the team leader for GoPro Original Production, explains: "What we captured inside of Guerlain's car was very different than a crash video. It was a deeply, ethereal, intimate human experience. We captured 'that moment'. A look on a man's face and a light in his eyes when he realises, 'This is it. I am going to die.'" He may not have beaten the world record, although Chicherit fortunately walked away from the accident with only a few minor injuries. Be sure to check out the video of the jump attempt gone wrong below.